"A Pictorial Journey" because we are always travelling towards who we about to become. My father and me when I was still very little indeed! 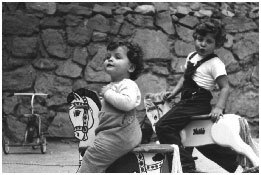 Me at the front and my sister, Mara Lee on her very groovy rocking horse I always wished belonged to me. What can I say? Hers just rocked better than mine! 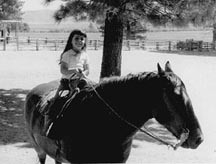 Here I am with "Little Jo" on a ranch in Nevada when I was 6 years old. I was quite a little cowgirl - I had no fear of horses no matter how big they were. 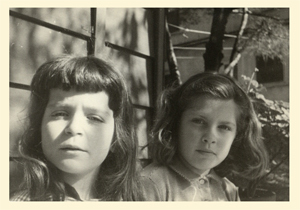 Sometime when we were 8 and 10 we got our own playhouse which was really a a wooden shed but we were very smug about it as you can clearly see. 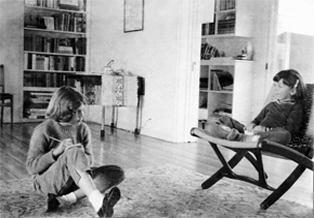 When we lived in Laurel Canyon in the livingroom and documented proof that the lotus position came quite natural to me!